Air conditioner filter that removes airborne particles like dirt, pollen and smoke. 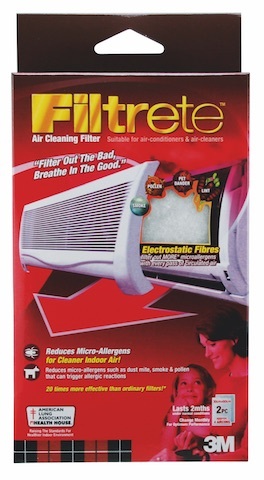 The Filtrete Air Cleaning Filter (regular). Filter out the bad, breathe in the good. 3M introduces the 3M Filtrete Electrostatic Air Conditioner Filter, which transforms air conditioner units to perform double-duty as air cleaners as well. The filter works like a magnet to effectively capture up to 97 percent of pollutants in indoor air. Constructed as an add-in component to the common air conditioner units in homes, the filter removes airborne particles such as dirt, pollen and smoke, which can be detrimental to health. According to a study conducted by the US Environmental Protection Agency, it was found that the air inside a home can be two to five times more polluted than the air outside, regardless of whether they were located in rural or industrial areas. Invisible to the naked eye, every one cubic metre of air inhaled contains more than one million particles of smoke, dust, mould and pollen of size smaller than one micron. Common sources of such pollution originate from unvented cooking in the kitchen, cushions, rugs and pillows found in the living and bedroom, wet towels in the bathroom, decorative house plants and pets roaming throughout the house. 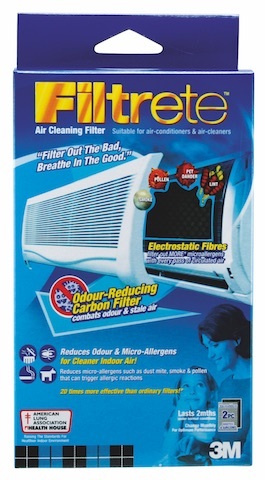 Filtrete Air Cleaning Filter (carbon), which additionally eliminates odours and stale air. According to the World Health Organization, allergies develop when the immune system mistakes these substances as harmful, and triggers allergy symptoms like watery eyes, coughing and wheezing. Affecting 20 percent of the world’s population, conditions such as allergic asthma and allergic rhinitis are a growing health problem. Prolonged exposure to such particles can develop into respiratory problems if they are not managed properly, especially in babies, young children, pregnant women and the elderly, who have weaker respiratory systems. Made of electrostatically-charged polypropylene fibres, the Filtrete Electrostatic Air Conditioner Filter sets up a three-step action of pulling micro-particles in, trapping unwanted particles and delivering clean air throughout the home. The 3M FiltreteTM Electrostatic Air Conditioner Filter (2pcs, 30cmx60cm) is available in two types – the FiltreteTM Air Cleaning Filter (regular) that retails at S$25.50, and the FiltreteTM Air Cleaning Filter (carbon) which additionally eliminates odours and stale air, that retails at S$28.90. They are available at selected FairPrice, Giant, Home-Fix, Popular, Selffix stores, e-commerce sites Lazada and Qoo10, and other leading retailers.